Esophagogastroduodenoscopy demonstrated white plaque lesions that extended from the gastroesophageal junction to the midesophagus. The gross examination immediately suggested infection with Candida species, but biopsy results pointed to a different culprit. A 29-year-old woman sought care in the emergency department after experiencing sharp epigastric pain over 2 days. She was initially seen at an urgent care center and empirically treated for gastritis with omeprazole. However, her pain progressively worsened and was accompanied by vomiting, prompting her hospital visit. Her medical history included mild intermittent asthma, which was treated with albuterol, and morbid obesity, for which she had undergone gastric sleeve surgery. Physical examination revealed an uncomfortable but healthy-appearing woman with normal vital signs. Her abdomen was obese, and palpation produced epigastric tenderness. Results from oropharyngeal, cardiac, pulmonary, extremity, integumentary, and neurologic examinations were normal. A complete blood count, tests of renal and hepatic function, and quantification of electrolyte levels all produced results within the normal range. Rapid screening for human immunodeficiency virus was negative, and viral load was undetectable. 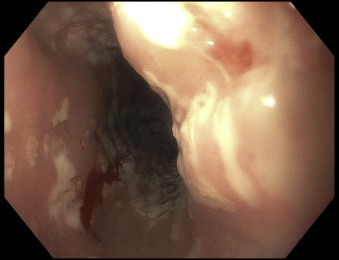 The patient underwent esophagogastroduodenoscopy, which revealed white plaque lesions extending from the gastroesophageal junction to the midesophagus (Figures 1 and 2). Biopsy samples were retrieved with a cold forceps. The gross appearance of the esophageal white plaque lesions was consistent with a diagnosis of Candidaesophagitis. Fluconazole was prescribed, but treatment provided no clinical improvement. 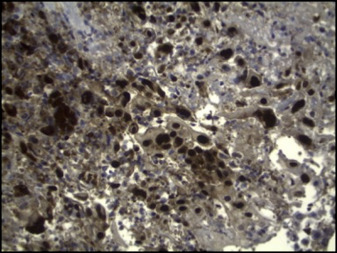 Pathologic examination of the endoscopic biopsy specimen revealed ulcerating esophagitis with intranuclear viral inclusions (Figure 3), and immunostaining proved strongly positive for herpes simplex viruses 1 and 2 (Figure 4). 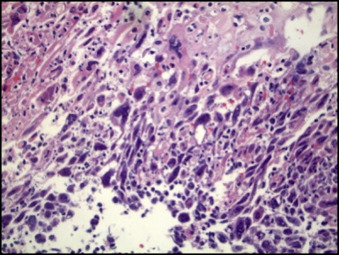 Periodic acid–Schiff/Alcian blue staining was negative for fungal organisms or intestinal metaplasia.